New and notable. 180fx laminate combines the visual drama of granite and the easy-going practicality of laminate, together now for the first time. Drawing on new digital technology, 180fx captures the true scale of a granite slab, re-creating the full impact of its striking color variations & exquisite veining. What’s more 180fx offers exotic beauty at a fraction of the price of natural granite. 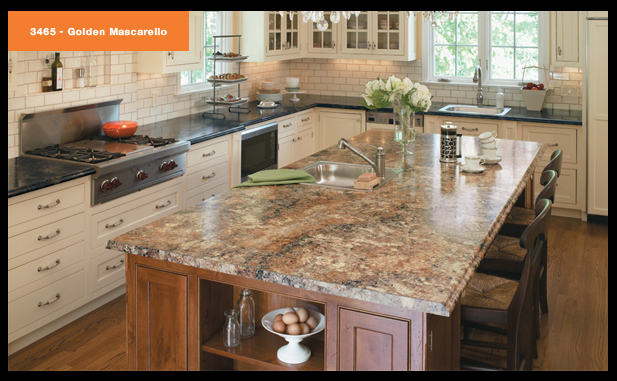 3465 Golden Mascarello - A large Scale exotic granite, the Mascarello pattern has dramatic veins of yellow and gold, with rich brown-black and white quartz. Available in Radiance Finish * This image is scaled to show full size pattern similar to a slab of real granite. Size shown is 5\' x 8\'. * Swatches are a representation of the color and it may vary from the actual final product. Please view an actual sample of the product prior to making your final selection. 3466 Antique Mascarello - Soft Gray Brown with dynamic patterning, sets beautiful Antique Mascarello granite apart. Available in Radiance Finish * This image is scaled to show full size pattern similar to a slab of real granite. Size shown is 5\' x 8\'. * Swatches are a representation of the color and it may vary from the actual final product. Please view an actual sample of the product prior to making your final selection.